The first edition of this dictionary was written during the years preceding 1980. No fiber optics glossary had been published by any recognized stan dards body. No other dictionaries in fiber optics had been published. 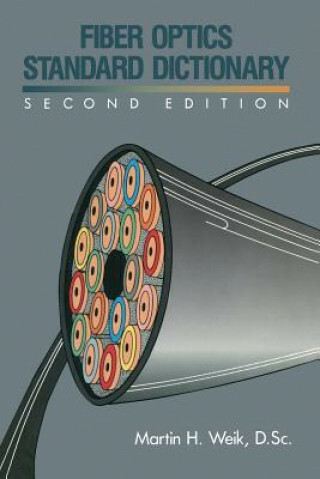 A significant list of fiber optics terms and definitions, NBS Handbook 140, Optical Waveguide Communications Glossary, was issued in 1982 by the National Bureau of Standards, now the National Institute of Standards and Technology. Since then several publications by standards bodies contained fiber optics terms and definitions. In 1984 the Institute of Electrical and Electronic Engineers published IEEE Standard 812-1984, Definitions of Terms Relating to Fiber Optics. In 1986 the National Communication Sys tem published Federal Standard FED-STD-I037A, Glossary of Telecom munication Terms, containing about 100 fiber optics terms and definitions. In 1988 the Electronic Industries Association issued EIA-440A, Fiber Optic Terminology. All of these works were based on NBS Handbook 140 com piled 10 years earlier. Currently the International Electrotechnical Commission is preparing IEC Draft 731, Optical Communications, Terms and Definitions. Work in fiber optics terminology is being contemplated in the International Organization for Standardization and the International Telecommunications Union. None of these works constitutes a comprehensive coverage of the field of fiber optics. Each was prepared by professional people representing specific in terest groups. Each work was aimed at specific audiences: research activi ties, development activities, manufacturers, scientists, engineers, and so on. Their content is devoted primarily to fundamental scientific and technical principles and theory rather than state-of-the-art and advanced technology.